The Emperor's Hammer, after the Battle of Endor, under the secret direction of the assassinated Emperor, began to consolidate its power in the Outer Rim Sector. Grand Admiral Ronin, the last of Emperor Palpatine's loyal Grand Admirals, assembled an elite Strike Fleet, the Emperor's Hammer TIE Corps, to secretly combat the Alliance now ruling as the New Republic. The Fleet Commander now calls all pilots in the Imperial Navy to join us and aid The Empire. Together we will restore The Empire to past glories! The TIE Fighter Corps is not for everyone. Only the best meet the stringent entry requirements - even fewer pass the intensive physical and mental challenge of basic training. You'll have to be tough, brave, intelligent and loyal to prove yourself worthy. If you have these qualities then you're made of the stuff we're looking for. 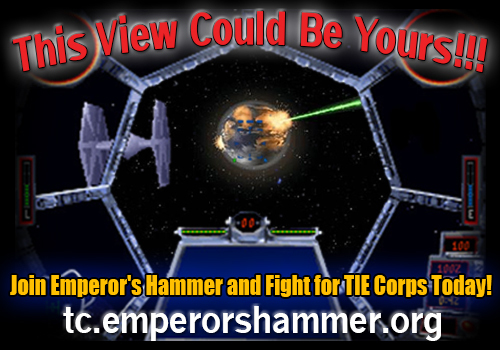 If you have the courage and valiance to make a difference for The Empire on the front lines of battle in the cockpit, the TIE Corps wants you! Across the galaxy, millions of gallant pilots are defending our great Empire from evil enemies who oppose law and order and now you can make a difference along side them! If you've got what it takes to be part of the most powerful military force in the galaxy, enlist here at the Recruitment Office. Do it today - and meet the greatest challenge of your life! You're looking for a challenge. One that can prepare you for anything. Where you can work with the best and discover strengths you didn't even know you had. You'll find all that and more in The Imperial Navy. A successful organization with over fifteen years of experience. A breathtaking vast Fleet! No matter how many of them may be active at any given time, know that more than 3000! members joined the Emperor's Hammer TIE Corps since 1994 when it was founded. Constant, consistent, intense role-playing between our members to further increase our comradeship. You'll feel as wandering the many decks of an Imperial Star Destroyer in a matter of weeks! The possibility of improving your skills as an imperial officer. So you want to command your OWN Squadron? Maybe a full Wing? An Imperial II-class Star Destroyer?! Annihilate rebels from the New Republic! We will turn this into facts TOGETHER.